The two companies have been working together since 2008 and now entered into another contract for the construction of a SOV to be put into work at the Moray East Offshore Wind Farm. ESVAGT designs and builds vessels with Norwegian Havyard Ship Technology. The tailor made vessel destined for Moray East will be a 70 metre SOV in Havyard’s 831L design. Delivery is destined for the beginning of 2021, bringing the number of wind vessels on contract to MHI Vestas to five in 2021. The two companies have been working together since 2008. 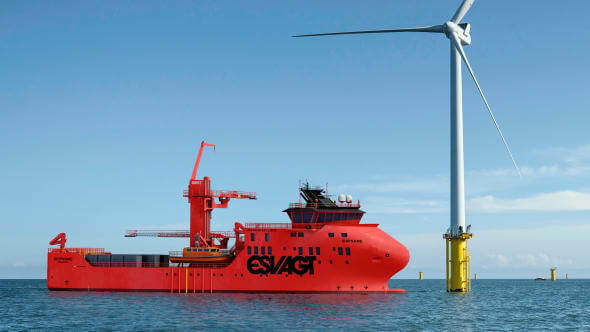 The past year, the 'Esvagt Mercator' has been servicing MHI Vestas in the offshore wind farms Nobelwind and Belwind in Belgium, and in August 2019, a newly built SOV will enter into a 15 year contract with MHI Vestas in the Deutsche Bucht Wind Farm in Germany. Just four months back, in September 2018, MHI Vestas and ESVAGT signed contracts for the delivery of two new SOVs for the Borssele III-IV parks (NL) and Triton Knoll (UK) and announced that there was also an option on a third vessel - which is the now ordered one. “It has been an exciting process to develop the concepts around the vessels, so they can give our technicians the optimal conditions to service the turbines whilst finding a balance to ensure a cost efficient vessel operation. With ESVAGT we have, over the years, developed a collaborative approach where no one is looking at the colour of the work wear, but everyone is working together to make our operation much more efficient and competitive”, says Keld Kristensen, Marine Specialist, Marine Engineering and Offshore Logistics for MHI Vestas Offshore. The French energy company wants to purchase 23.3% of the electricity generated from the 950MW wind farm. The wind turbine manufacturer has received an order from Vattenfall to supply its new SG 10.0-193 DD to the world's first non-subsidised offshore wind farm, Hollandse Kust Zuid (HKZ) 1&2. As always, Danish wind turbine manufacturer Vestas reported a large number of orders received at the end of Q1.